Will Ragland: Losing out on Ervin Santana, who opted for a more pitcher friendly Turner Field, was huge and will leave big holes in a rotation that busted a lot of bubbles last year. Run production will be anemic if Reyes and Bautista can’t stay healthy and Lawrie has been a bust for all the hype. Maybe there’s something in the air (I’m looking at you Mayor Ford). One upside is the bargain signing of former all-star catcher Dioner Navarro, who signed a two-year deal for $8 million. He struggled before hitting .300 with the Cubs last year, but anything will be better than Arencebia’s production. It will also be interesting to see if Melky Cabrera still has it. OPG: One of the areas that seemed like a logical place to improve over the offseason was the starting rotation. The Blue Jays have several starting pitchers who were previously top propsects (Ricky Romero, Kyle Drabek, Drew Hutchison), but have had disappointing careers to date either because of injury or ineffectiveness. Do you think there is any hope for any of them or are they basically sunk costs at this point? WR: The Jays won’t have enough quality innings from their starters to make a run at the top, even if their staples, Buerhle and Dickey, come through strong (both of which are question marks). J.A. Happ was awful in the spring and will start the year in Triple-A Buffalo along with Romero and Drabek. Ugh, what happened? At least their bullpen is solid with Casey Janssen closing (if he ever gets the chance) and Sergio Santos taking set up duties. OPG: Toronto has had trouble in the past attracting top free agents to sign with the team due to (I’m guessing here) the higher tax rates and the fact that it’s…Canada. If you were a free agent, how much of a higher salary would you require to sign with them (as a percentage)? Also, feel free to any add quirky contract requirements you would want to request to sweeten the deal (such as 37 boxes of orange jello)? WR: I have to defend Toronto, which is a lovely and diverse city, rich in culture and governed by a maniac mayor that may or may not be a crack addict. The Skydome (err Rogers Center) is still an amazing place to catch a ballgame although it’s aging and the playing surface looks to be from Veterans Stadium. My contract would need to include a free apartment and room service at the built in stadium hotel, America’s national anthem to be played before Oh Canada at the start of every game, and free Molsons for any teammate whose PECOTA stolen base projection is below 7 for 2014. OPG: Seeing as the Blue Jays are a Canadian team, do you think it would be more appropriate for their uniforms to be made of denim (i.e., Canadian tuxedo)? WR: I’d definitely be down with playing in jeans, but very opposed to any of this skinny jean non-sense that my wife seems to buy me every Christmas. OPG: Brett Lawrie started his major league career red hot in 2011 (in 43 games), but had a somewhat disappointing 2012 and 2013, at least with the bat. Do you expect more production out of him moving forward, or have we seen the real Brett Lawrie the past 2 years? 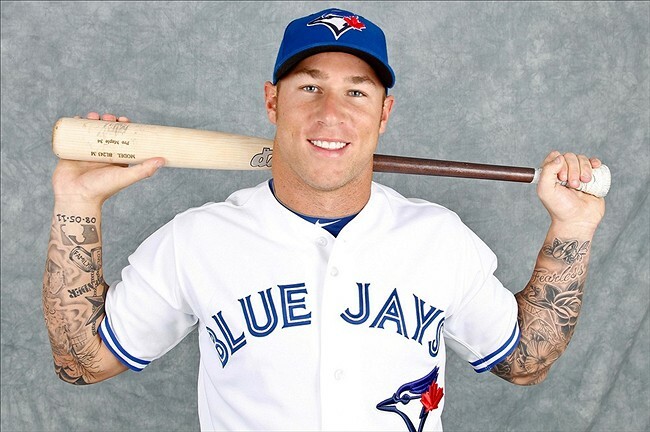 As a follow up, if you could put any one of Brett Lawrie’s tattoos on yourself, which one would it be and why? WR: To be honest, it would be great to see a Canadian rip it up for Toronto and he has the tools to do it. His facebook pictures (Edward 40 hands) seem to suggest he still has some maturing to do however. None of the spider-web rose themed tat action would really work for me. Pete Rose’s ink is much more style. This entry was posted on March 28, 2014 at 10:00 am and is filed under Offseason with tags AL East, Toronto Blue Jays, Will Ragland. You can follow any responses to this entry through the RSS 2.0 feed. You can leave a response, or trackback from your own site.